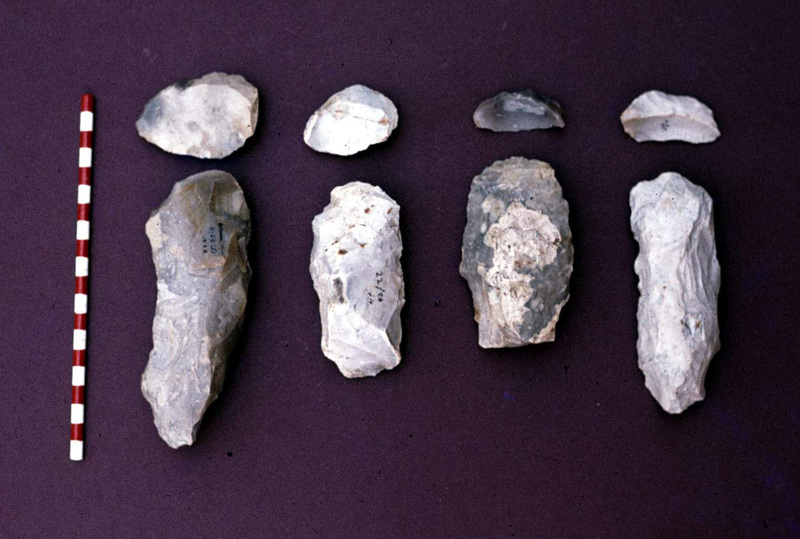 The Mesolithic (Middle Stone Age) in Britain covers the period from 10,000 to 6,000 years ago (8,000 to 4,000 BC). It was the time of the last hunter-gatherers. 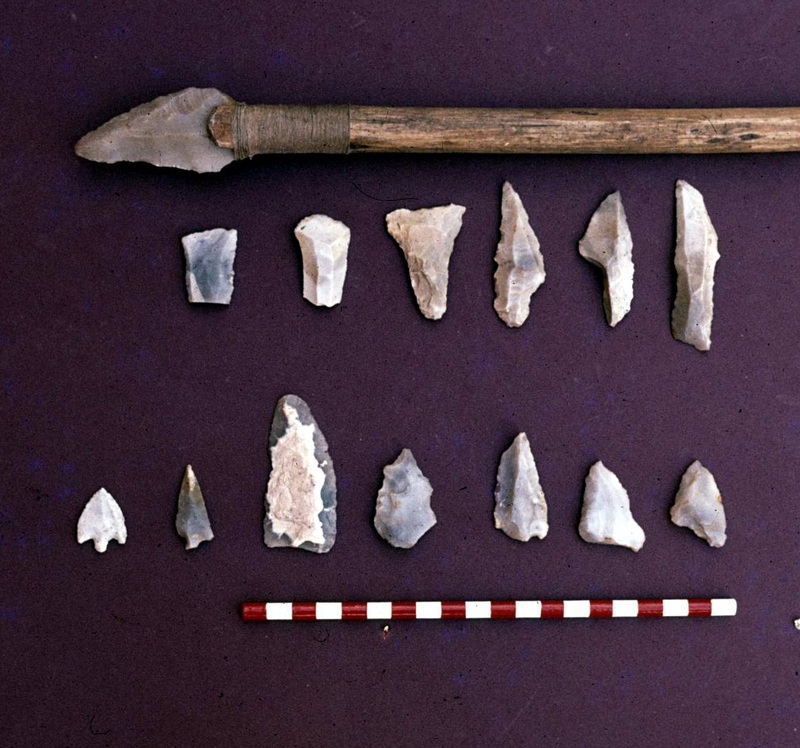 It is characterised by changing flint tool technology, involving the composite use of small, sharp artefacts (microliths). 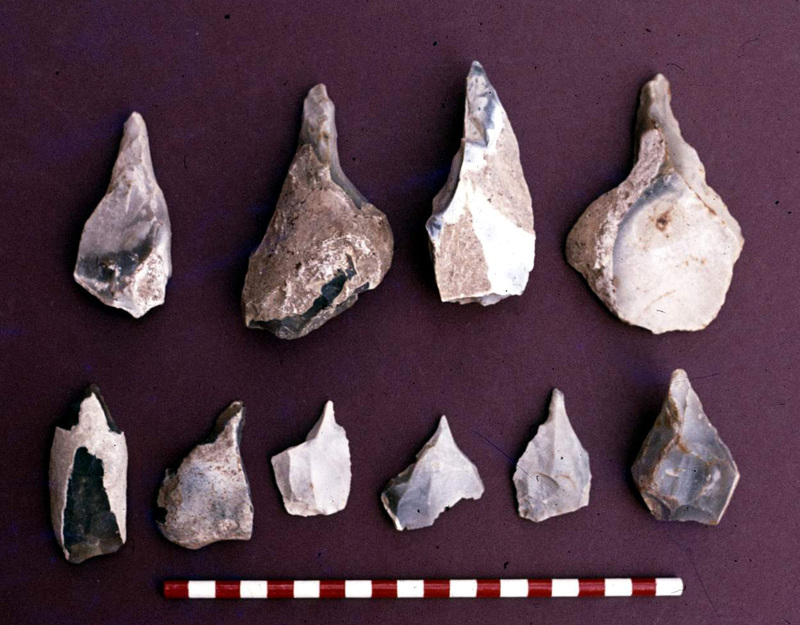 On the other hand, large adzes and ‘tranchet’ (from the cross-blow sharpening flake) axes are also a feature. In Hampshire there are many prolific sites, such as Oakhanger, Wakefords Copse, Broom Hill, where the flints can be numbered in hundreds and thousands. They must represent seasonal camps, returned to year after year by small nomadic bands. 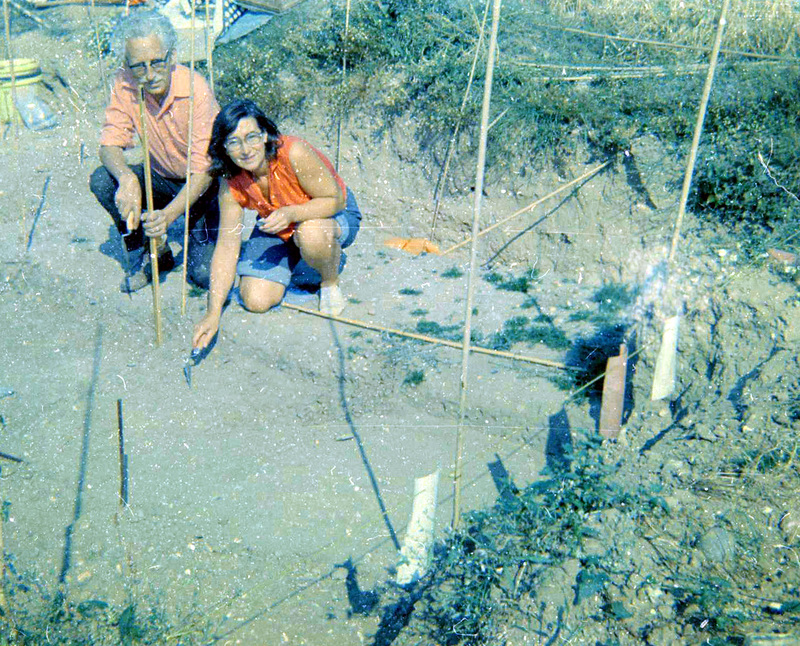 At Broom Hill, Braishfield, near Romsey, in 1971, Michael O’Malley found large quantities of Mesolithic flint. The discovery set in motion a seven-year excavation programme, in conjunction with the Lower Test Valley Archaeological Study Group, covering 125 sq m and recovering, with innovative sieving techniques, over 89,000 struck flints. Mike O’Malley was an Ordnance Survey Surveyor and aligned the site with the National Grid, laying it out in metre squares. 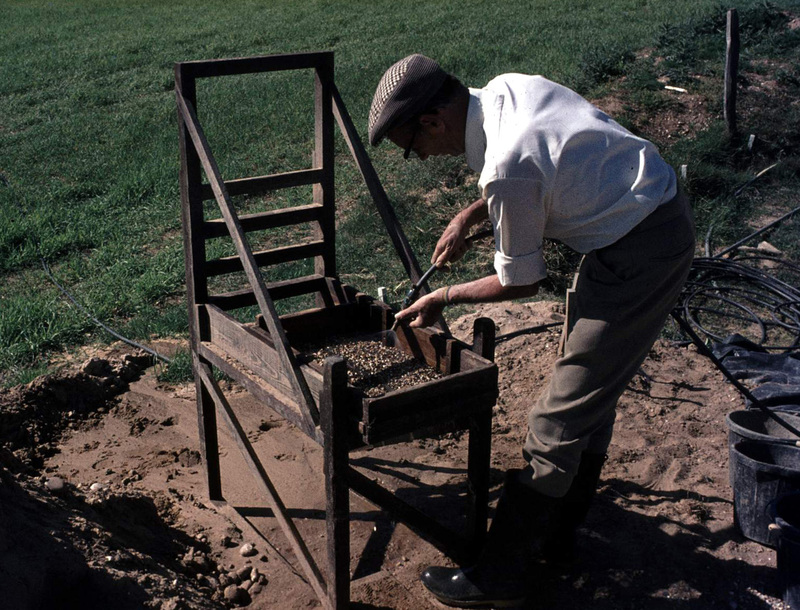 The sieve, built by Nicholas Johnson, used a tiered system, with meshes of 1/2, 1/4, and 1/8th of an inch, and the device allowed recovery of an average of 27 microliths from each 1m transect. Mr M Palmer and another helper, 1973. The site is located on a patch of Eocene sands, on the southern slope of the hill close to a strong permanent spring with good views to the south. 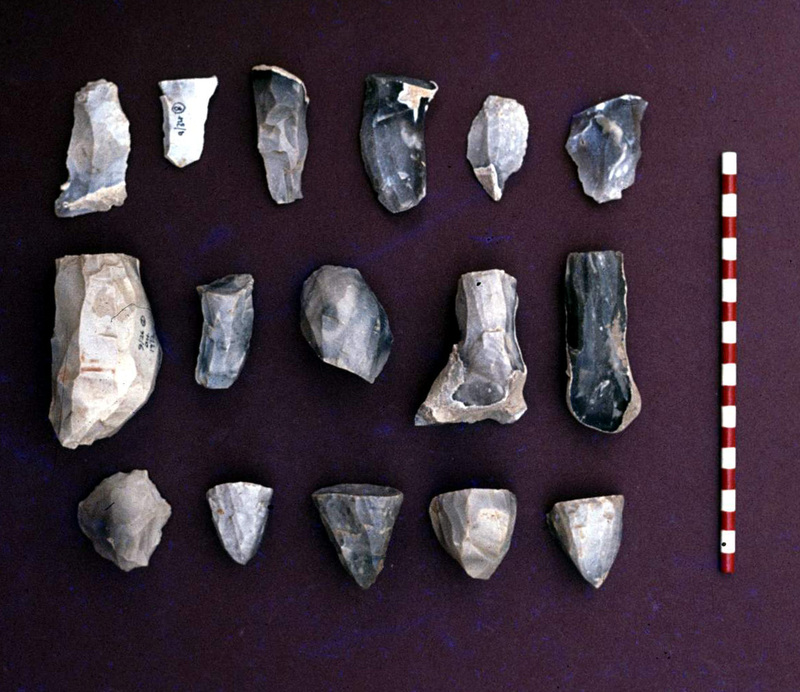 Radiocarbon dates suggest that it was in use for about two thousand years from 6500 to 4500 BC, making it a Later Mesolithic site. 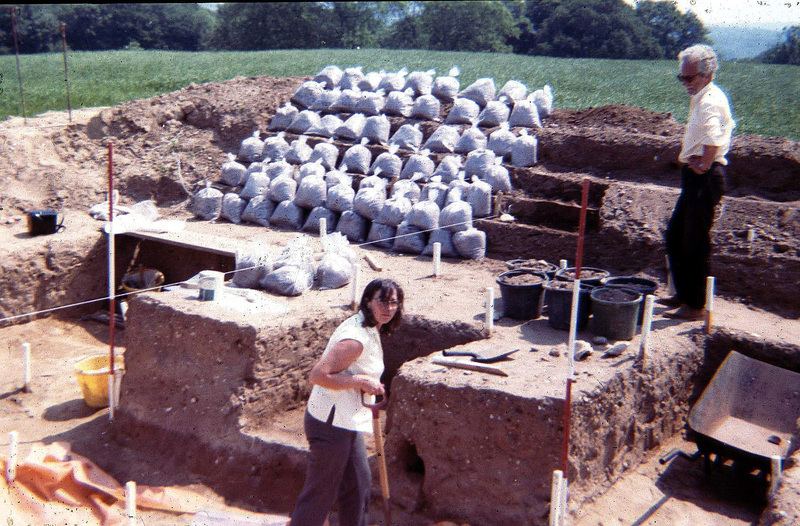 O’Malley felt that one of the four pits he excavated, surrounded by 14 post and 34 stake-holes, could have been a dwelling. 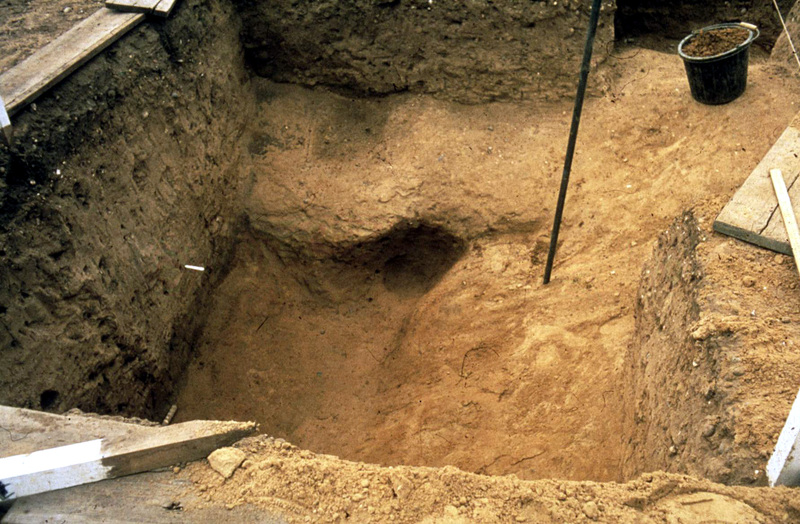 At the centre of the feature was a substantial, deeply embedded posthole and near to that, a hearth. The contents of one 1m square from inside the dwelling was bagged up in 62 layers and sent to the University of Cambridge for analysis. Carbonised hazel nut shells were evident throughout, suggesting autumn and winter occupation at the site. 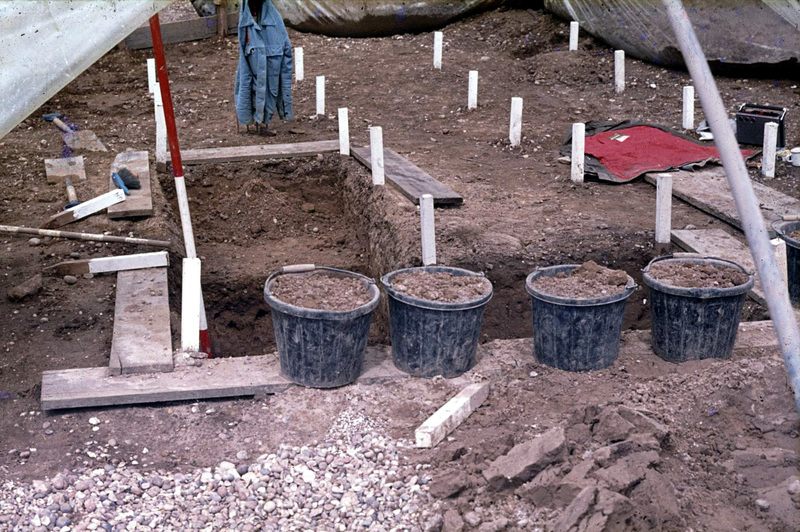 The site has not seen definitive publication and it may be difficult now to interpret some of the structural evidence. 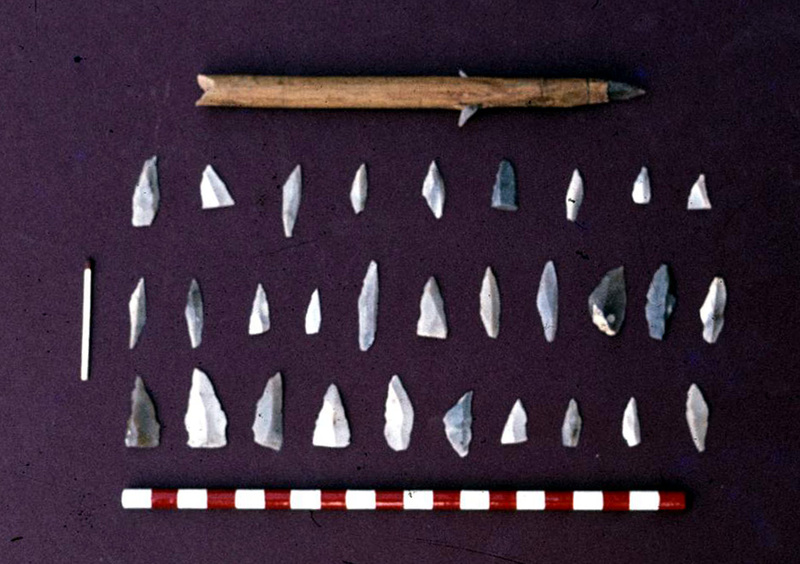 What is not in doubt is the remarkable collection of flint, including more than one hundred core axes and adzes. 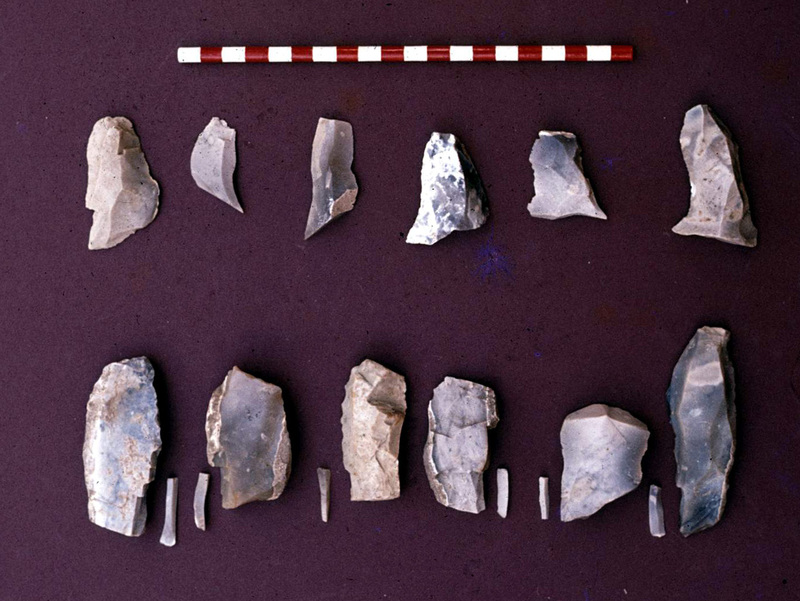 Study of the sharpening and intermediate flakes from these artefacts suggests that they were being made on site for use elsewhere. 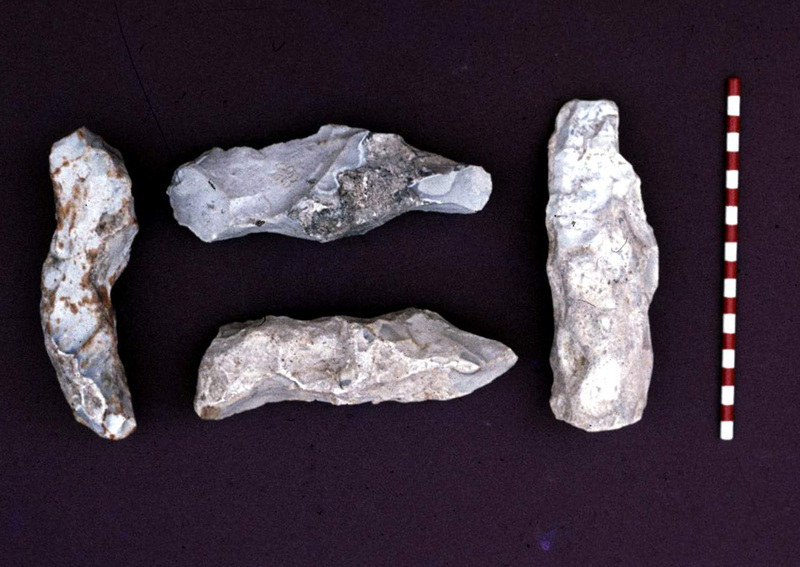 High grade flint is found in the local chalk, but the presence of Portland chert, slabs of Purbeck rock, and burnishing tools made of fine-grained slate hint at contacts, if only at exchange level, with groups further west. 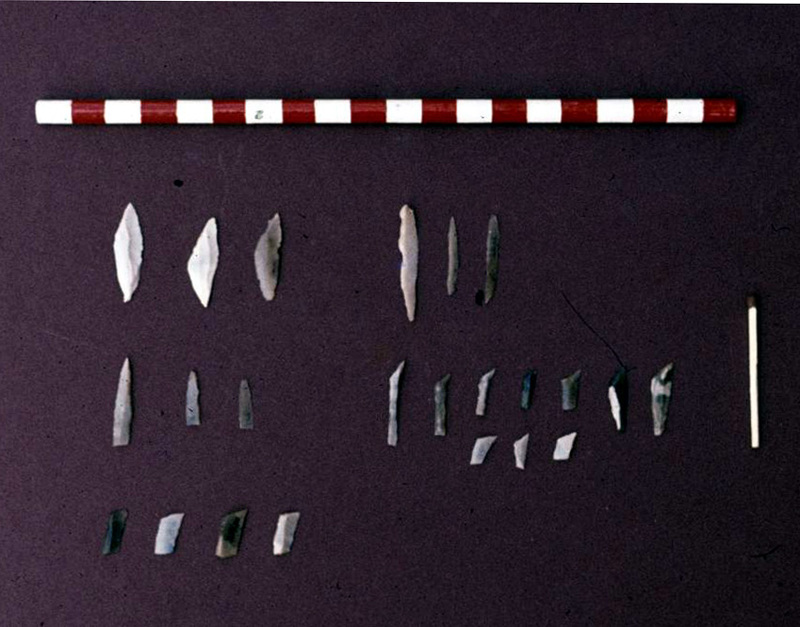 A cascade of flints – including (from bottom to top) tranchet axes and sharpening flakes, piercers, cores and blades, arrowheads,cores, adzes or picks and small blades (microliths), including an O’Malley reconstruction. Series by Dave Allen, Sarah Gould, Lesley Johnson, Jane King, Peter Stone, with help from Stacie Elliot. By davidwhallen in News, Stone Age on August 3, 2015 .